INSTRUCTIONS: Tonight’s topic is inserted below. Please read about our purpose and why we pray ahead of time, if you can. Thank you for joining us. Conference Call Instructions: (720) 735-7025 before 6:30 pm MDT to join us via Uber Conference. We gather at Denver’s Our Lady of Lourdes Classic School in the 6th grade classroom. Please join us. Tonight our prayer intentions are for Martha Bridgewater, Olga, Kyle Hunt and Sr. Anne Marie’s brother Greg. The Facing Our Immortality Spiritual Exercise is an integral part of our monthly cancer support group. It is here where we form relationships with one another and in Christ. We never walk alone. We are a spiritual ministry, based on the principles of Catholic teaching, for those who are pained and aggrieved by cancer or serious illness. We meet once per month in a safe environment, which provides a loving atmosphere formed in the community of Christ. Mutual respect for the dignity, privacy and confidentiality of each participant is fully embraced. This Spiritual Exercise is designed to elevate conversation, understanding and support to a deeper faith-based perspective where our life-experience, especially at the present time, has God, and His plan/dream for us personally, at the center. This will involve working deeply with the mystery of suffering in our lives. The Holy Spirit will animate much of this unfolding and direction with each group. We will begin with an opening prayer followed by the Spiritual Exercise. Our Spiritual Exercise was developed by Fr. James Flanagan of The Society of Our Lady of the Most Holy Trinity (SOLT). Cancer is not an individual experience. It is, generally speaking, a family experience, and so the family needs spiritual protection, healing, blessing, and just a general entrusting into the hands of God. Our Lives are relational. Cancer is something that intrudes into that, or is even sometimes, a consequence of long standing, unhealthy relationships. So it is never true that the person with cancer is the only one involved. There is always a context, and human relationships are always in deep need of the grace of God. Prayer is an essential way to bring that grace into these relationships and contexts. We are going to strive then to see things relationally, both in our human relationships and our divine relationships. Why We Pray: There are three elements involved in spiritual exercise: The Art of Listening, The Art of Reflection and The Art of Dialogue. If we are to “hear” God’s Word it is essential that we learn how to listen to the Word, the Spirit, others and even ourselves. We must be able to distinguish between these voices also. Most of your time spent in the Spiritual Exercise will be using this art. We must not only listen to what is said, but we must learn to listen to what is not said. To really listen to one another we must empty ourselves of all prejudgments and biases. We must be open and receptive. We need, therefore, to enter the Spiritual Exercise with a spirit of humility. We must realize that we need others, and they need us to live the Trinitarian Life, which is a life of community. This second art is more directly related to the Spirit In this art we learn to open ourselves to the Spirit who teaches us “all things”. The art comes in learning how to open yourself to the voice of the Spirit within you. During the time of reflection we are not to think of very erudite things to impress people with our knowledge of theology or with our scholarship. It is a time when we open ourselves so the Spirit can teach us Himself. He will take us at times back into the Word to the Person of Jesus. At other times He will take us to our own life experiences, because in those life experiences He has been leading and teaching us. Therefore, a real relationship with the Person of the Spirit has to grow within you. The more you use this art, the more sensitive you will become to the Spirit and the more He will direct you. Because we are the Body of Christ, and because we have to grow to that oneness in the Body, which Jesus himself prayed for, we come to a time when we share our reflections of the Spirit. This again is not an intellectual discussion, nor is it a psychological unburdening (although sometimes it will have that effect). As this art develops, little by little this time will become a moment of humble and fraternal communion with God and others, a moment of attentive listening to God through the lives of others. You will find that where you were not open to the Spirit during the time of reflection, the Spirit can speak to you through someone else’s experience of Him. We teach each other through our sharing because we are one in Christ. The art is to give what comes from our hearts, not from our learning. We must give what comes from the Lord to each other. This art is really a sharing of the Lord with each other in praise, in thanks and in life. This gift, therefore, is not for ourselves only, but for others which finds its roots and source in the community of the Trinity. These three arts are skills that can be learned and developed, under, of course, the guidance of grace. And like all skills the more they are used, the more proficient the person becomes in them. The Trinity is community! And if you’re going to come into that Trinitarian life you must live as community. “We humbly approach you O Most Holy Trinity as we beg for your healing. You are Our Father and we trust in your goodness as you draw us daily to become what you call us to be. We humble ourselves before you as we acknowledge your greatness and your infinite mercy. Please dispel within us any form of idolatry that we may truly worship you with all our being, as Mary our Mother did. Jesus, our eternal shepherd, we come to you like the many sick and the infirm that approached you. We beg you to fill our hearts and our souls with the faith of the Centurion who only asked you to say but the word, and he knew that his servant would be healed. Or like the woman, we come to touch your garments with great confidence that your healing power will flow through this cloth to the one it is placed upon now. For those of us who struggle with believing in your power to heal, we pray that you help our unbelief. Holy Spirit, we rely on the humility that you give us as we bring our request before your presence. We often do not know what to ask and how to ask. Often we struggle with knowing what God’s will is for one who is sick. Yet we know that it is your love that can enkindle the flame within our feeble hearts. Help us to accept the healing that comes from your love; so that we may praise the glory of your Name! 2) Subtlety, meaning that we will have a spiritualized nature in the sense of a spiritual body as did our Lord as we learn at 1 Corinthians 15:44: “It is sown a corruptible body, it shall rise a spiritual,” i.e. a spirit-like, “body.” We see that Christ’s glorified body was able to pass through closed doors. 3) Agility – the glorified body will obey the soul with the greatest ease and speed of movement as we read in 1 Corinthians 15:43: “It is sown in weakness, it shall rise in power,” that is, according to a gloss, “mobile and living.” Saint Thomas Aquinas says, “But mobility can only signify agility in movement. Therefore the glorified bodies will be agile.” We discern agility, our Resurrected Lord’s ability to bilocate and travel great distances in an instant. 4) Clarity – the glorified body will be free from any deformity and will be filled with beauty and radiance as we read at Matthew 13:43: “The just shall shine as the sun in the kingdom of their Father,” and Wisdom 3:7: “The just shall shine, and shall run to and fro like sparks among the reeds.” Here clarity refers not being “clear” but to being “bright”. It is worth noting that the Virgin Mary has already received her glorified and resurrected body. Hence, she has the four gifts of the resurrection. May we persevere so as to receive these remarkable gifts. It is good to remember that for believers, the path to Resurrection goes through suffering and death. In the divine economy, Jesus even makes persecution one of the beatitudes. As Fr. John Hardon, S.J. writes, the beatitudes are “promises of happiness made by Christ to those who faithfully accept His teaching and follow His divine example.” The pattern of Jesus’ redemptive work passes by the Way of the Cross. So too will we, and our age be redeemed in the same way. So how can we access the same healing Jesus so freely gives in the Gospels? Many ways are possible. But we are given 3 special gifts during Lent which stir up the waters of grace in our lives. Prayer, Fasting and Almsgiving. Prayer stirs up the grace we need for deeper healing in our relationship with God. Fasting brings the waters of grace down upon the disorder we have within ourselves. And Almsgiving opens up rivers of grace in our relationship to others. Our deepest healing will always come first and foremost from eliminating sin in our lives. Sin always brings suffering, both personal and at the same time, upon the whole Body of Christ. There is no such thing as a private sin. As Our Lady of Fatima warned us over a century ago: war, something we often live in fear of, is a consequences of sin, both private sin and institutionalized, communal sin. Questions for Reflection: Silence for 5-10 minutes. 1.What are the greatest obstacles to hope today? 2.What do we think our own resurrected body will be like? What do we look forward to most? 3.The desire for transcendence is built into our very nature. Where do you see signs of this even among unbelievers? 4.What does Jesus show us about the Resurrected Life? Consider his movements after Resurrection and before the Ascension. C. GENERAL GROUP DISCUSSION: Allow the Holy Spirit to take the lead. Our next meeting will take place Monday May 13, 2019. Please add this to your online calendar and/or save to your mobile phone. Watch Sr. Anne Marie Walsh’s brief video about Facing Our Immortality, which she created to share with the joyful students from CMA by clicking here. Please remember to invite others who you feel may benefit from our monthly spiritual exercise group. They do not need to be Catholic. We welcome patients, survivors, spouses, caregivers and surviving spouses. All are welcome. Session begins at 6:30 pm, MDT. Please call (720) 735-7025 before 6:30 pm to join us via Uber Conference. We gather at Denver’s Our Lady of Lourdes Classic School in the 6th grade classroom. Please join us. Tonight our prayer intentions are for Amanda’s Tia Rosa and her mom Blanca, Annette Martinez, Greg Walsh, Don Lufton, we are also deeply saddened that Linda Johnson’s brother, James Rivera, passed away. Please pray for his soul, his wife Barbara and his son Michael. We will begin with an opening prayer followed by the Spiritual Exercise. Our Spiritual Exercise was developed by Fr. James Flanagan of The Society of Our Lady of the Most Holy Trinity (SOLT).Below is an overview of the process. Why we pray.There are three elements involved in spiritual exercise: The Art of Listening, The Art of Reflection and The Art of Dialogue. This Lent, Jesus will approach us with the same question: ‘Do you want to be well? Do you want to know where sin has crippled you, paralyzed you? And do you want to know true freedom?’ Because, Jesus comes to destroy the sickness of sin and the deformity it causes in our lives. We only have to desire it and choose it. Many years ago, an older friend shared a dream that deeply disturbed him. He was walking through a lovely forest when he came upon a clearing with a house in the middle of it. The house exerted a powerful pull on him. Everything within him wanted to go into that house. So he approached the screened-in porch, entered, and headed for the front door. As he walked up to the front door, someone came up to him and said: “Before you can go in you have to eat this.” He looked down to see a plate of dog excrement being handed to him. He, of course, was upset that he could have had such a dream, not knowing at first what it could possibly mean. But then, in a flash of insight it became clear. The dream was an attempt to reframe a deep struggle that had to do with an almost over-powering temptation to grave sin. Everything within him wanted to give in to the attraction of this particular sin. Yet his faith told him that if he gave in to this sin he would so defile himself that it would be like eating a plate of manure. Sin is really that ugly, and it’s an ugliness we give ourselves. We often recognize that something is wrong within us, in the deep recesses of our being. We are attracted to things that are not good, things that enslave us, make us feel ugly about ourselves, and keep us from true freedom. And once we are bound, immobilized as it were, it takes an intervention of God’s grace to free us. We cannot free ourselves. Jesus wants to free us not only from sin but from the effects of sin in our lives. We are not alone in this need. Everyone who has ever been born needs this healing, liberating grace. The saints tell us that a soul in the state of grace is beautiful beyond compare. This is what Jesus wants to restore in us: our original beauty! Additionally, if you want to have the same direct encounter with Jesus that the crippled man had, start frequenting the sacrament of Penance and Reconciliation, and Holy Communion after that. Every sacrament contains within it a personal encounter with the living God. Hence, every sacrament contains rivers of grace that can change us to the degree we let those waters flow. Jesus tells us that not all sickness is a result of personal sin. Yet it is an undeniable truth that sin causes suffering, both personal and communal. 1. What are your observations of this in the world? In your own life? 2. Do you think there are actually people who don’t want to be well? Why would that be? 3. How does Jesus heal? And for what ultimate purpose? 4. Why does Jesus leave some people with their suffering? C. GENERAL DISCUSSION: Allow the Holy Spirit to take the lead. Our next meeting will take place April 8, 2019. Please add this to your online calendar and/or save to your mobile phone. Sr. Anne Marie Walsh will be speaking at the Catholic Women’s Conference in Sioux City, Iowa on March 30, 2019. For more information, go to their Facebook page at https://www.facebook.com/homeofthetrinity/. Catholic Medical Association: Richard and Denise presented to medical students from Colorado’s Catholic Medical Association (CMA) a few weeks ago about Facing Our Immortality. The emphasis was that we offer an opportunity for people of faith to be in communion with the Lord and with one another, creating a family that upon which we can share in our stories and our faith. We never walk alone. To learn more about CMA, please link here. Father Woody’s Haven of Hope Almsgiving Opportunity. Richard and Denise (more so Richard) go to their day-shelter every Monday from 11:00 am to 1:00 pm. This important part of our overall ministry offers individuals with serious illness/cancer an opportunity to pray and talk about their illness and circumstance. It is through communication and communion that there is hope for renewal in their lives, both personally and spiritually. They are truly enjoying time in the chapel. If you have time on Mondays, we could use your help. It is a joy to be there. Print our handout: For a copy of our Spiritual Exercise group flyer, please link here. We have new business cards. Please ask for some in order to help spread awareness about our cancer ministry. 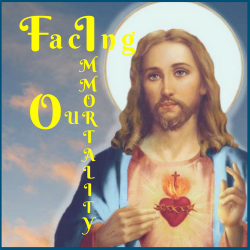 Our Facebook, https://www.facebook.com/FacingOurImmortality/ page will also show the upcoming events. Please also follow our page to receive alerts. Call (720) 735-7025 before 6:30 pm to join us via Uber Conference. We will begin with an opening prayer followed by the Spiritual Exercise. Fr. James Flanagan, Society of Our Lady of the Most Holy Trinity (SOLT), gives an explanation below of the elements involved, and then how to do an exercise. There are three elements involved in spiritual exercise, The Art of Listening, The Art of Reflection and The Art of Dialogue. Most of us believe in angels, but we seldom pray to them. We imagine them wistfully flying around us, guarding or guiding us. But they are pure spirit, and we can’t relate to that aspect of their nature. Fathoming a special bond with your angelic guardian may seem awkward, but it’s a devotion we all can adopt in order to deepen our interior life and grow in sanctification. Why is a devotion to our angel important? To begin, the angelic theologians and most exorcists concur that our guardians chose us. They knew us before we were created, and out of love and obedience to God, they said yes to His offer to protect us. This means they have had full knowledge of our temperaments, every sin we’ve ever committed, and all the good we would do in life. They likely know us better than we know ourselves. Imagine you had a bodyguard who was always with you. He did all the usual bodyguard things like protecting you from danger, warding off assailants, and generally keeping you safe in all situations. But he also did more than this: he offered you moral guidance, helped you become a stronger person, and led you to your ultimate calling in life. 1. Sometimes we visualize moral decision-making as a debate between a bad angel whispering in one ear and a good angel speaking wisely in the other. There is a truth to this: according to St. Thomas Aquinas, one of the roles of the guardian angels is to fight off demons (Summa Theologica, Part 1, Question 113, Articles 2-6). Guardian angels not only ‘guard,’ they also can save us when we are already in trouble. This is illustrated by the story of Peter in Acts 12, when an angel helps break the apostle out of prison. The story suggests that it is his own personal angel that has intervened (see verse 15). Of course, we cannot count on such miracles. But it’s an added comfort to know that they are possible. Church Fathers once debated whether guardian angels were assigned at birth or at baptism. St. Jerome argued decisively for the former. His basis was Matthew 18:10, which is a crucially important Scriptural passage that supports the existence of guardian angels. In the verse Jesus says, “See that you do not despise one of these little ones, for I say to you that their angels in heaven always look upon the face of my heavenly Father.” The reason that we get guardian angels at birth is that their aid is associated with our nature as rational beings, rather than belonging to the order of grace, according to Aquinas (Question 113, Article 5, Answer). Aquinas explains how the angels operate in accordance with God’s providential plan for all men (Question 113, Article 6, Answer). It follows that these angels serve as a reminder of His care for us. Akin says that guardian angels act as intercessors who bring our requests directly to God based on Jesus’ words in Matthew 18:10 about angels beholding the face of God. It follows from the above that guardian angels also aid in bringing us nearer to God. Even when God seems distant, just remember that the guardian angel assigned to you personally is at the same time beholding God directly, as the Catholic Encyclopedia notes. According to Aquinas, one of the roles of our angelic guardians is helping us use our reason to pursue virtue. In particular, he says the angels help us in developing prudence by serving as God’s “universal instructor,” passing on God’s precepts (Question 113, Article 1, Reply 2). A second way that angels enlighten us, Aquinas says, is by reinforcing our intellects. As he puts it, “[T]he human intellect as the inferior, is strengthened by the action of the angelic intellect” (Question 111, Article 1). In addition to working through our senses and intellects, our guardian angels also influence us through our imaginations, according to Aquinas, who gives the example of Joseph’s dreams (Question 111, Article 3, On the Contrary and Answer). But it might not be something as obvious as a dream; it could also be through more subtle means like a ‘phantasm,’ which could be defined as an image brought to the senses or the imagination (Question 111: Article 1, Answer; definition adapted from the Dictionary of Scholastic Philosophy by Bernard Wueller, SJ). Angels cannot directly move the will, but, according to Aquinas, they can indirectly influence it through our senses and intellect, as stated above (Question 111, Article 2 , Answer). This means that our guardian angels influence every part of our being for the better—our senses, intellect, and will. Inspired by Christ’s words in Matthew 18:10, St. Augustine suggests that guardian angels remind us that our ultimate goal is the beatific vision of God: “As, then, they see, so shall we also see; but not yet do we thus see. Wherefore the apostle uses the words cited a little ago, Now we see through a glass, darkly; but then face to face. This vision is reserved as the reward of our faith; and of it the Apostle John also says, When He shall appear, we shall be like Him, for we shall see Him as He is. 1 John 3:2. By the face of God we are to understand His manifestation, and not a part of the body similar to that which in our bodies we call by that name” (City of God, Book 22, Chapter 29). Guardian angels assume their duties at our birth and maintain them up to our death. For Aquinas, this is just an extension of the broader truth that we never completely leave God’s care, even in sin and doubt: “Now it is evident that neither man, nor anything at all, is entirely withdrawn from the providence of God: for in as far as a thing participates being, so far is it subject to the providence that extends over all being. 1. Why is it a good idea to develop a relationship with your guardian angel, especially in the midst of suffering, trial and difficulty? 2. Have you had experiences where you were aware of the involvement of angels, even in retrospect? 3. How do you think you can benefit more from the gift God has given us in our angels? Additional Resource: https://catholicexchange.com has many different articles on angels. Just plug “angels” into their website search. SHARING – If you feel the need, please share your thoughts. This is a time to share without reciprocal comment. What was your experience? Our next meeting will take place March 11, 2019. Please add this to your online calendar and/or save to your mobile phone. Please check the website for meeting location. We are scheduled to have the meetings at Our Lady of Lourdes Catholic School on the second Monday of each month from 6:30 pm to 8:00 pm. Please check the website for the conference call line (for those not able to come to the meeting in person). We currently use Uber Conference: 720-735-7025. Father Woody’s Haven of Hope – Richard and Denise (more so Richard) go to their day-shelter every Monday from 11:00 am to 1:00 pm. This important part of our overall ministry offers individuals with serious illness/cancer an opportunity to pray and talk about their illness and circumstance. It is through communication and communion that there is hope for renewal in their lives, both personally and spiritually. They are truly enjoying time in the chapel. If you have time on Mondays, we could use your help. It is a joy to be there. We want to know when you are in need of special prayers. Ongoing prayer requests are sent out via email, but also published on the website. The website also has a section for resources and prayer links. We appreciate additional suggestions that you may have, and as our ministry grows, we will continue to add more information in this section. If you would like to request a prayer request, please email Denise at facingourimmortality@gmail.com. There are also comment and request forms within the website. Remember that these spiritual exercises can be done at any time. You may feel the desire to take another look at one from the past. Please let us know if you would like another copy from a past session. Thank you so much for your prayers as well.